Next-generation sequencing is now commonly applied to measure genomic modifications, providing an accurate view of cancer progression. However, several challenges, including tumor purity, heterogeneity and the broad set of cancer associated cellular functions, increase the difficulty of interpreting cancers and make analyzing them distinct from analysis of germline diseases. The ability to detect low allelic mutations in the broad set of cancer-associated genes is critically important. To respond to those needs, we have developed the ACE Extended Cancer Panel, a targeted enrichment sequencing platform that includes over 1,300 cancer genes and 200 miRNAs. 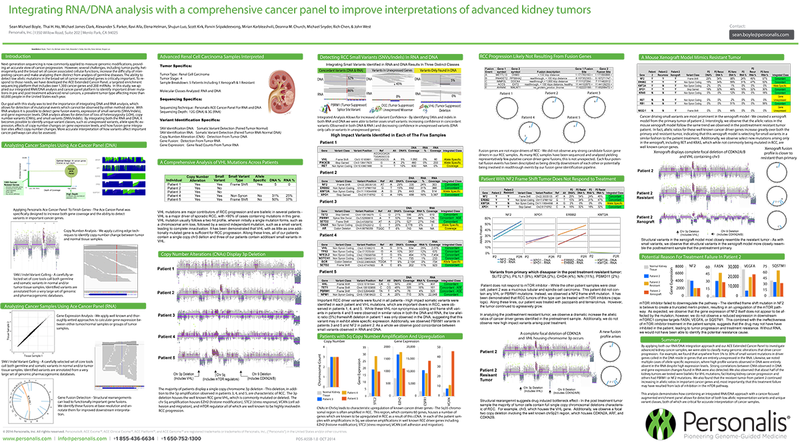 In this study, we applied our integrated RNA/DNA analysis and cancer panel platform to identify important driver mutations in pre and post treatment advanced renal cancers, a prevalent tumor type affecting more than 60,000 people in the United States each year. Our goal with this study was to test the importance of integrating DNA and RNA analysis, which allows for detection of mutational events which cannot be observed by either method alone. With RNA analysis it is possible to detect gene fusion events, expression of small variants (SNVs/indels), and gene expression levels. DNA analysis allows for detection of loss of heterozygosity (LOH), copy number variants (CNVs), and small variants (SNVs/indels). By integrating both the RNA and DNA, it becomes possible to identify unique variant classes, such as unexpressed variants, allele specific expression, effects of copy number changes on gene expression levels, and how fusion gene integration sites affect copy number changes. More accurate interpretation of how variants affect important cancer pathways can also be assessed.